My sister Ellen is on spring break this week from her teaching in Sacramento. This past weekend she spent a couple of days with us, along with my mom, who came down from Lynden. 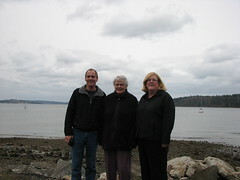 We also got to spend some time with my other sister, Susan and her husband, Jack who are from Olympia. Mom didn't join in much of the conversation, but I'm sure she enjoyed being around her children. She and Ellen went to church with us and Mom really enjoyed clapping with the worship songs. Ellen just bought a pink EEE PC, so I was able to show her a few things about them. It didn't take her long to be off and running with it. Markus was also home as his spring break is also this week. He is off now to Colorado spending a week with cousin Zac in Breckenridge. It was a busy weekend for me, trying to squeeze in play practice and then report cards.